I spent a quintessential Pacific Northwest day in Gig Harbor touring the 2018 HGTV Dream Home. Brian Patrick Flynn did an amazing job designing the home around the selected Sherwin Williams palette. Infusing the soft pastel colors of the coastal area and proving black is the new grey for exteriors. I'm obsessed with the clean lines and modern approach on this remodel. Have you entered to win this dream home? If not, what are you waiting for! Did I mention you can enter for a chance to win twice daily! Click HERE to read the official rules to enter and check out HGTV.com to watch the amazing transformation of this waterfront home. This dreamy coastal retreat sits on the shores of the Puget Sound in a quiet neighborhood on a hillside. Can you see yourself pulling into this view every day? I sure can! Staying true to the Northwest aesthetic, Brian accentuated the classic A-frame of this remodel with streamlined windows and an open floor plan. 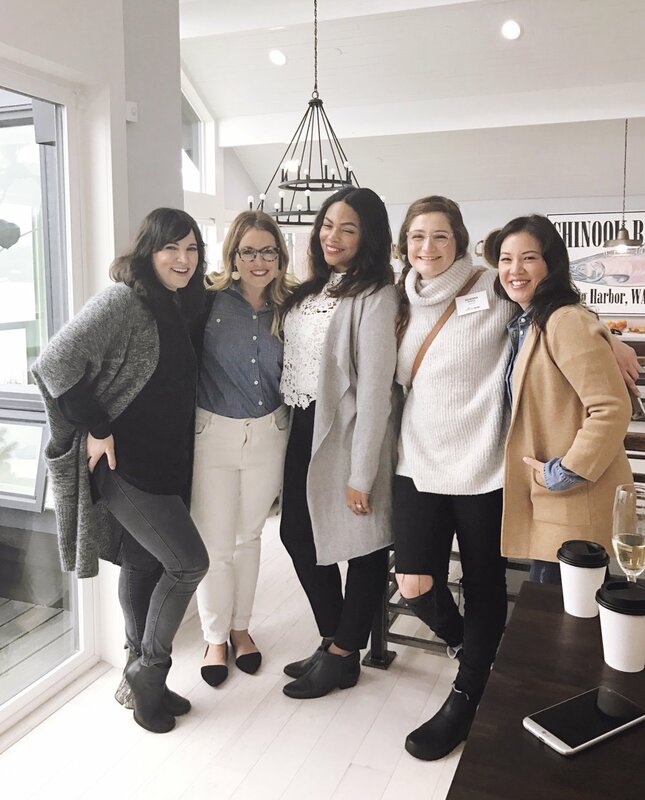 L to R: Cassandra LaValle, Mallory Ziglar, Brandy Brown, Joanna Hawley and Anita Yokota, were all smiles on during this VIP tour experience. Brian, and the entire HGTV team were the cherry on top! Chef/Owner of Salare Restaurant and JuneBaby Restaurant in Seattle, Edouardo Jordan prepared and demonstrated tasty tutorials for everyone to enjoy throughout the afternoon. Light, bright and full of white, I was tempted to run myself a luxurious bath as soon as I entered this gorgeous master bathroom suite. I adored the the charming touches of jute, driftwood and marble. The homemade DIY granola Chef Edouardo taught us was one of my favorite highlights. Who knew it was so simple to make and prepare your own yogurt?! Every bedroom has a color scheme that had every influencer in attendance oohing and awwing! I loved the lush simplicity of the accessories, the crispness of the muted tones and layered linens. I walked around the property and snapped this shot on my way back up from the waterfront. View our Instagram stories for a behind the scene look! I love the exterior of this home! Local artist, Celery Jones did a phenomenal job on the custom large-scale artwork throughout the house. She tapped in to the essence of the Pacific Northwest and the surrounding wildlife.